Evacuee Centers or Military Work Camps? How dare he? While New Orleans faces a calamity unseen in American history, while bodies float down the rivers that used to be streets, while families huddle on rooftops waiting for help that doesn't come, while thousands wait to die, our president can't be bothered to even address the catastrophe. Instead, he poses for the cameras and gives a speech likening the Iraq occupation to World War II and raking in the campaign dollars. He has shown NO leadership. He has shown no compassion. He has shown virtually no interest, even. What he has done is denied the funds needed for New Orleans to pay for much-needed upgrades to the levee and pump systems, upgrades which if completed could have saved the city and thousands of lives. He has worked to gut FEMA. He has worked to decentralize the federal response to national disasters. All in the interest of saving money to be either used in the Iraq occupation or given to his fatcat corporate friends. (Editor and Publisher, Salon) He is guilty of dereliction of duty and gross incompetence. Why is such a detached, cold-hearted, compassionless, indifferent, sociopathic, traitorous son of a b*tch leading this country? I say impeach Bush now. The victims of Katrina, and the Bush adminstration, deserve no less. 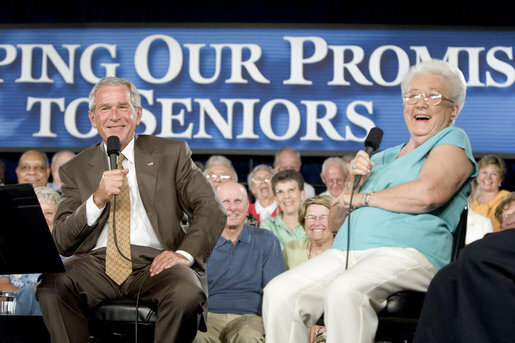 On the morning of August 29, as Katrina is wreaking havoc along the Gulf Coast, Bush laughs with a rich senior citizen in El Mirage, Arizona during a staged event hawking his Medicare proposals. The number of Americans who died along the Gulf Coast while Bush laughed it up can never be known. Interestingly, earlier that morning, Bush does make one decision -- as the price of oil spikes to over $70 a barrel, he decides NOT to release any oil from the national reserve. Then it's off to Arizona for fun and sun! 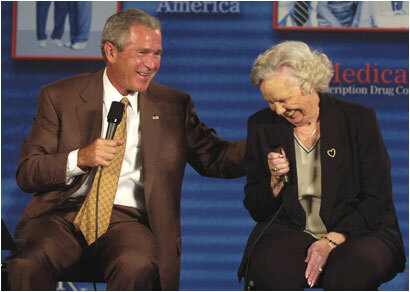 August 29: Bush laughs it up with a senior citizen during another staged Medicare event in California. This is during the afternoon; Katrina has just rolled past New Orleans and directly over Gulfport, causing terrific devastation. 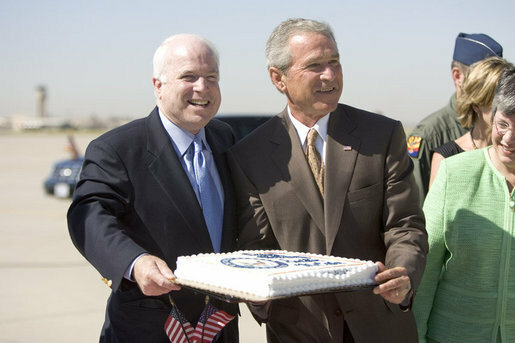 August 30, morning: Bush and McCain yok it up over McCain's birthday cake in El Mirage, Arizona, before Bush delivers a speech on immigration. Katrina has moved on, but the swath of destruction through Louisiana and Mississippi is just now being calculated. Hundreds are already dead; hundreds more are dying from injuries; thousands are dispossessed, with no food, water, or medical attention. 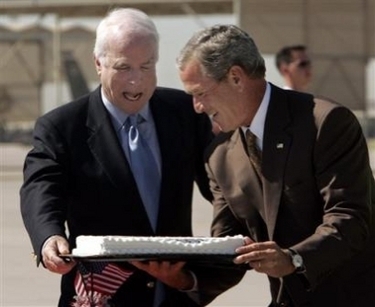 But Bush is enjoying John McCain's birthday cake. Gosh, it's all so much fun! Wonder what's happening with that hurricane...? 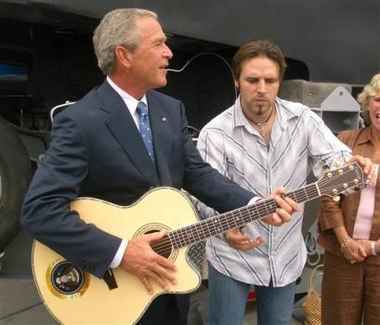 August 30: Bush pretends to strum a guitar presented to him by country singer Mark Wills during an afternoon event at a San Diego naval base. (Note the presidential seal on the guitar, obviously carefully prepared beforehand. Some things are quite well managed....) Residents of New Orleans, Gulfport, and other stricken areas find themselves without food, water, medicine, or shelter; the emergency response from the federal government is all but non-existent. Most wonder where they will be able to sleep tonight; meanwhile, after a day of fun and speech-making, Bush flies back to his comfortable bed in Crawford, Texas, where he will spend a lazy evening before flying to Washington Wednesday morning. Thanks to DWCG of the Daily Kos for providing these photos. Click on the link to read more about Bush's "working holiday" during Katrina. The diary also provides information about how the Bush administration systematically cut funding for the New Orleans levee restoration project that could have saved the city from the worst of the flooding. Secretary of State Condoleezza Rice bought $3000 worth of shoes at the exclusive NYC boutique Ferragamo (money that could have been donated to victims instead of used to adorn Condi's dainty feet); when a shopper yelled at Dr. Prettyfeet, "How dare you shop for shoes while thousands are dying and homeless!" the shopper was forcibly removed from the store. Rice then took in the show "spamalot" on Broadway, earning boos from the audience when the lights went up. Note: Although I am heavily indebted to the tireless researchers on the Daily Kos and other blogs and Web sites, the opinions stated on these pages are entirely my own.